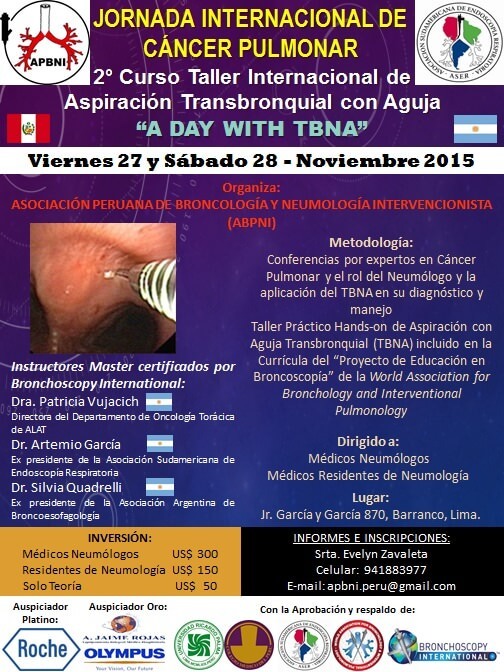 International Lung Cancer Seminar and cTBNA Course: "A day with TBNA"
The Peruvian Association for bronchology will hold an International Lung Cancer Seminar and a Conventional Transbronchial Needle Aspiration (cTBNA) course in November 27 and 28 in Lima, Peru. BEP Master Instructors from Argentina will come to Peru to support the program. We will conduct comprehensive lectures on Lung Cancer topics and Hands-on workshops with inanimate models. We will use cTBNA practical approach exercises and the Essential cTBNA questions as part of the workshops. The program will receive the endorsements of Ricardo Palma Peruvian University and the Peruvian Medical Board.